Fax service remains important for many businesses and for others, it’s used less often but is still a key component of any communications system. 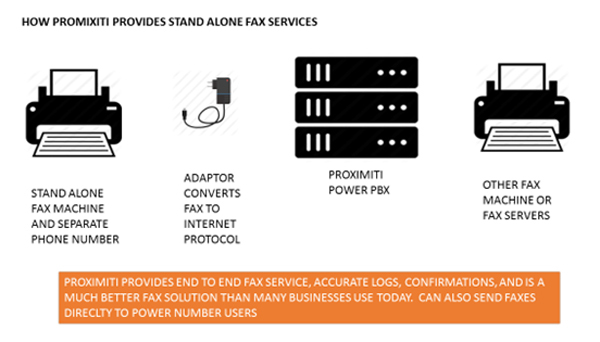 Proximiti offers a diverse set of fax capabilities that can be configured for your needs. 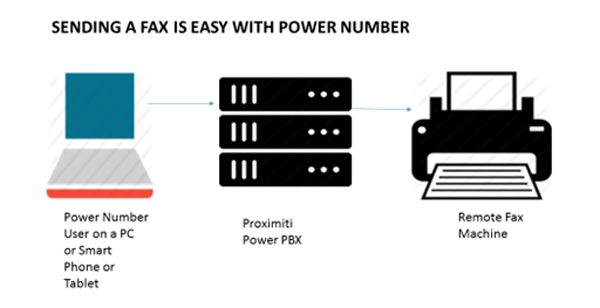 Most of Proximiti users get fax mail as part of their Power Number. They can receive faxes on incoming calls to their Power Number as the Proximiti switch recognizes the fax tones before the call is delivered to the user and the fax is captured and then inserted into their inbox (Shout!) and optionally as an e-mail into that inbox (or both). There are no special fax numbers to remember. From any smart phone, tablet, or PC a Power Number user can send a fax by opening Shout! (the Proximiti Messaging application that is part of GoTools, a free app or by accessing the Proximiti web page and logging in), select a contact or contacts, attaching a document, picture, or PDF. You can even send faxes from your smart phone or tablet and even a picture. Just open GoTools and select Shout and pick a contact, attach any kind of file, and select fax. Proximiti takes care of the rest. You can even send it as an e-mail (most common use). Many offices still have the need to take source document in printed form and send to other locations. Fax usage has declined but it’s still helpful in certain situations. Here’s how Proximiti provides stand-alone fax machine support for today’s new office communications services. In this case, the business doesn’t need a fax machine but would still like the capability to send and receive faxes on a separate number. 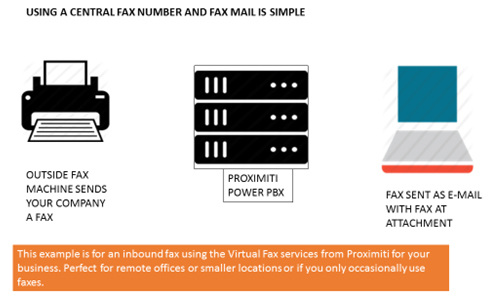 Using Proximiti, we provide or port your existing fax number and capture inbound faxes with the Power PBX and convert to e-mail with the fax as an attachment and can forward to one or multiple addresses. Fax services are included as part of every Power Number (no separate charge). For stand-alone fax machines with their own independent fax number, the monthly charge is $34.95 with a cap of 4,000 pages. A one-time purchase and installation of the adaptor is $199.